This webpage discusses the theory and the practice of computing and interpreting the return on invested capital. The essential definition of return as measuring the return on core operations of the company rather than some vague formula that you should calculate using a specific definition. In fact there are is a lot of ambiguity in computing this statistic when you want to focus on operations and you often have to make judgements from the notes of financial statements to determine both what should be in the numerator of the calculation and what should be in the denominator of the calculation. To illustrate this I present some case studies on this page. 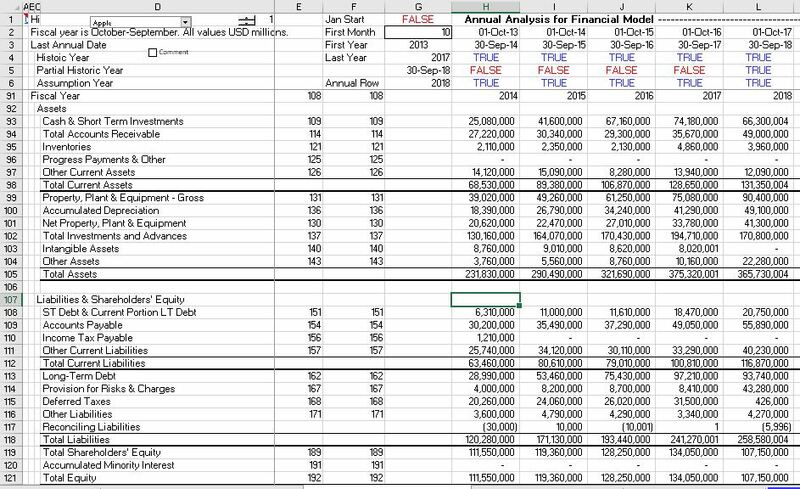 In using a financial model to compute value, the ultimate issues is whether the company being valued is making good investments and growing. You want to know about whether the core fundamentals of the company are good — are its products selling well, are its factories operating efficiently etc. If a company is earning a lot of money because it bought stock in another company or because interest rates have fallen, this does not tell you anything about the core operations. In fact, for things like debt and other investments, you can easily make valuations from the market. If the company earns a little or a lot more than its cost of capital on its core operations, the company should grow and it should have a relatively high value. When you boil things down, the financial model is about forecasting returns and growth and assessing risk. When applying the value principles, the difference between the ROE and ROIC is not trivial and related to some kind of financial theory. ROIC should do something crucial, and that is to measure the returns from the core business of the company. That is, without pollution of the effects of things like having a whole bunch of cash on the balance sheet or investments in other associated or non-associated companies or making money from changes in the value of derivatives and other financial instruments. Being careful with calculation of return on invested capital is illustrated using the case of Apple. Apple has billions of cash on its balance sheet as shown below (66 billion — this comes from the financial database). But when you look at the balance sheet more carefully, you can see that the long-term investments are even larger — 170 billion. This is also financial investments that has nothing to do with selling i-phones or mac’s. So the real amount of cash — 246 billion is much more. Then when you look at the capital structure you can see that the amount of debt and equity (93 billion plus 108 billion) is less than the total amount of cash. These means there is no invested capital financing the rest of its assets. In computing ROIC, you should focus on the operations and compute the NOPAT. The NOPAT is the EBIT less tax that would be paid on EBIT. But you must make sure that the EBIT is not polluted by anything related to financing or other assets. You can see in the income statement for Apple below that the EBIT is 73 billion. You can take away taxes from this and arrive at the NOPAT. 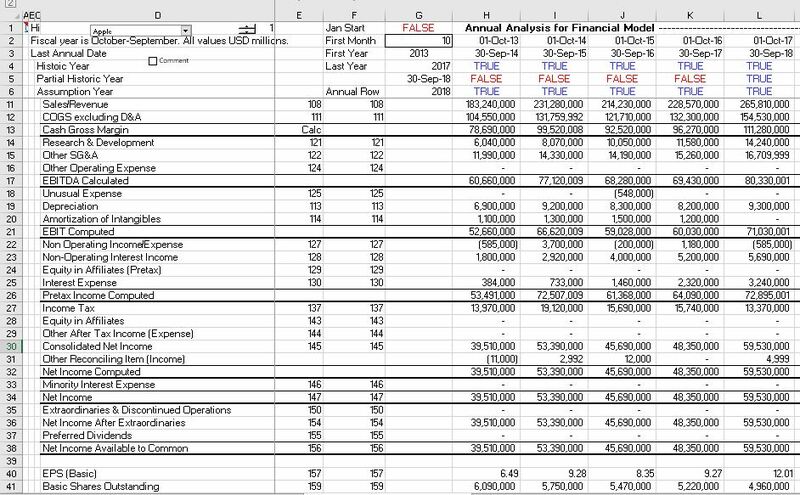 Computation of the ROIC for Apple is shown in the screenshot below. This depends on how you classify other liabilites. When other liabilities are classified as financing (see the method of 1’s and -1’s using the SUMPRODUCT method below), the invested capital and the NOPAT is shown in the screenshot below. The ROE means nothing and the only real issue with such a high return is whether the company can keep growing. If you want the file that downloads all of the Apple stuff and can download much more, I have attached the file to the button below. This may be a good file to use because it only has one company and does not take a long time to download. To illustrate the judgment in computing ROIC consider the case below for HT Media in India. You can look at the numbers in the file attached to the button below. The files below illustrate what happens when you make some different assumptions in computing NOPAT. I will keep emphasizing that if somebody gives you a rule and tells you that is the only way to compute ROIC, you should say B.S. — but spell it out. The idea is to decipher what is really in accounts like other income and other investments. So the first case assumes that other investments are related to core operations and that other income is also related to core operations. This produces an ROIC that is shown in the first graph. In the second case, the same assumptions are made except that the actual tax rate is used. On the screenshot below, the return on capital employed is provided by the moneycontrol that I used to download the data. In the third case I use the closing price and present the return on other investments. In this case you get a dramatically different result. These results are explained further in the paragraphs below. I am sorry about being critical in creating this page. I am trying to combine practical tools with theory in explaining all of the modelling steps. This section reviews how can use my database program and how to use the read pdf program to acquire data for corporate modelling. I explain why I created these files and suggestions on how to think about various items in the financial data. Before I developed the read pdf file or the financial database file, I used to try to create a relevant a case example for companies in my classes. I would get pdf files with financial reports and then struggle with pdf files trying to retrieve the data. This really sucked. It would take hours and hours. That is why I started to develop the read pdf file. I then modified my file for reading in data and after a participant in one of my courses from Switzerland told me he uses Market Watch and wanted an automatic way to download and update the data. I finally understood that you could get historical financial statements from the internet. So, in describing how to set-up a financial model I begin with description of how to retrieve data in a from a practical standpoint. I am using companies in India to illustrate the process. To operate the database that comes from the automatic database need to find a website that allows you to access their data in excel. 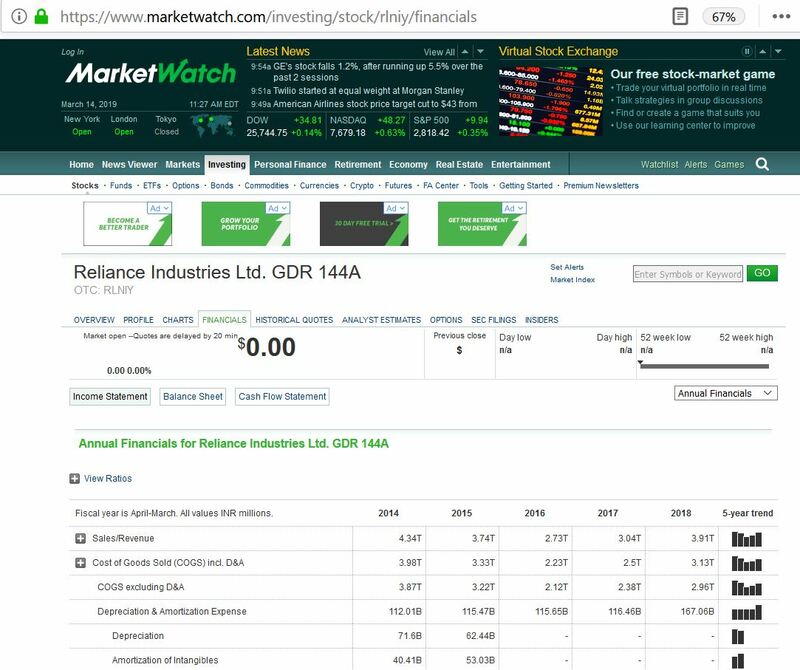 In our case for Indian companies, any company with an ADR stock has detailed financials published in MarketWatch. You need to go and find the ticker symbols so that you read in the financial data. What I do is simply to go to google and put in the company name along with MarketWatch. Note in the screenshot below the symbol is rlniy in the url which is the same name as on the page. It takes a little while, but I suggest making sure the MarketWatch has financial statements as for some companies there is a Market Watch page, but no financials. Once you have done the difficult job of getting the tickers, you stick the tickers into the database file and then start retrieving the data. As both annual data and quarterly data is downloaded for all of the companies, there can be a massive amount of data and cause little problems with excel. You can also make some mistakes like I do (for example not continuing to count the numbers in the yellow column). In this case you can just continue the reading of the financial data which takes much longer than anything else. The screenshot below illustrates the list of ticker symbols for the India case study after the painful process of finding the ticker symbols. To make this yourself you need to get the URL’s as shown below. Why want real data rather than screens; you want to compare to economic series. I used to hate classes where I tried to get the financial reports and then come up with different ways to get the data into models.